The temple of Mahalsa Narayani is located at the small village of Mardol, just about a km from the famous Mangueshi temple. 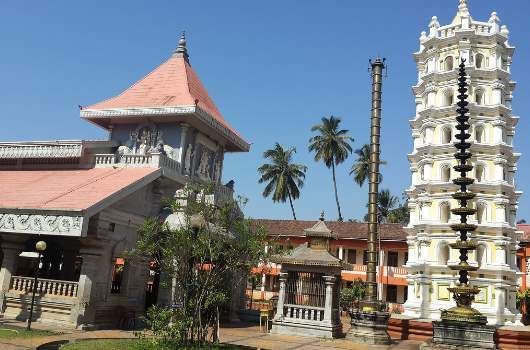 The temple of Mahalsa Narayani is located at the small village of Mardol, just about a km from the famous Mangueshi temple and about 22 kilometers from Panaji, the capital city. Originally, the deity was housed in a temple at an ancient shrine in village of Verna which is now the site of an industrial estate. 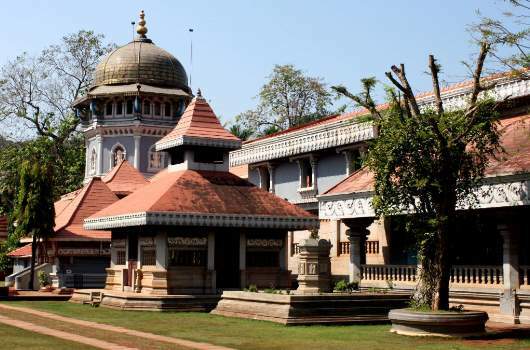 Along with other Goan temples, this beautiful temple at Verna was also marked for destruction by the Portuguese around 1543. However, before the actual demolition could take place the idol of the deity was smuggled away across the river by faithful devotees, to the safer locale of Mardol, where it is located today. The Goddess Mahalsa is supposed to be an incarnation of Lord Vishnu, hence the name Mahalsa Narayani (Narayan being another name for Vishnu). There are a number of legends associated with the deity and how she came into being. The more famous legend has it that, in ancient times, a beautiful goddess appeared on the Sonsada plateau at Verna. She was first seen by a shepherd named Sahastrapal, who was taking his master’s cattle for grazing to a nearby spring. The goddess asked the shepherd to bring his master to the location. When the shepherd appeared reluctant saying that the cattle were thirsty, the goddess created a spring by hitting the ground with her nupur (musical ornament worn on the ankle). The small Nupur Lake which was thus created can still be seen today. The shepherd went to get his master, but could only get his son-in-law name Mhal Pai who was asked by the goddess to build a temple in that location where she would reside as Mahalsa Narayani. The temple is located in peaceful environs at Mardol. 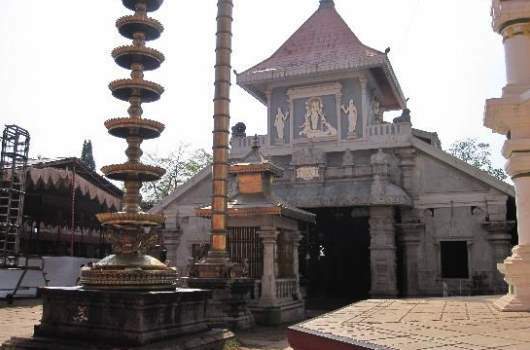 The temple has huge wooden pillars and a silver framed doorway. In the courtyard, there is a magnificent brass samai (ornamental lamp pillar) which is 40 feet in height and has 21 rings of a hundred fifty small lamps. When it is lit up with oil wicks on the annual festival day or Jatra, it is a sight to behold. Besides the Jatra, there are two other special festivals held at the temple – the Jaiyanchi Puja around the month of August and the Kojagiri Pornima just after the mosoons on full moon day.